Paper Rock scissors Rock The shamis adventure. Executive Summary Story You are the Confused lumberjack who sets out to make his fortune, but threw strange coincidence you ends up seeking the truth about your parents death. Told by the townsfolk that the evil rock killed his parents is told by the great tree that this is not true but to find out the truth he must talk to the rock king, but to get to him he must save the tree nymph who will grant passage. In the end you find that his parents were stoned by the townsfolk. 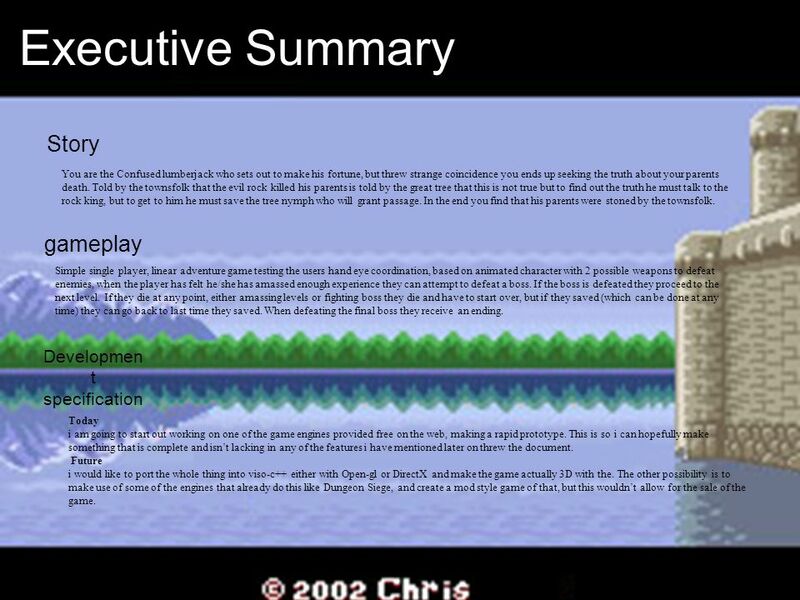 gameplay Simple single player, linear adventure game testing the users hand eye coordination, based on animated character with 2 possible weapons to defeat enemies, when the player has felt he/she has amassed enough experience they can attempt to defeat a boss. If the boss is defeated they proceed to the next level. If they die at any point, either amassing levels or fighting boss they die and have to start over, but if they saved (which can be done at any time) they can go back to last time they saved. When defeating the final boss they receive an ending. 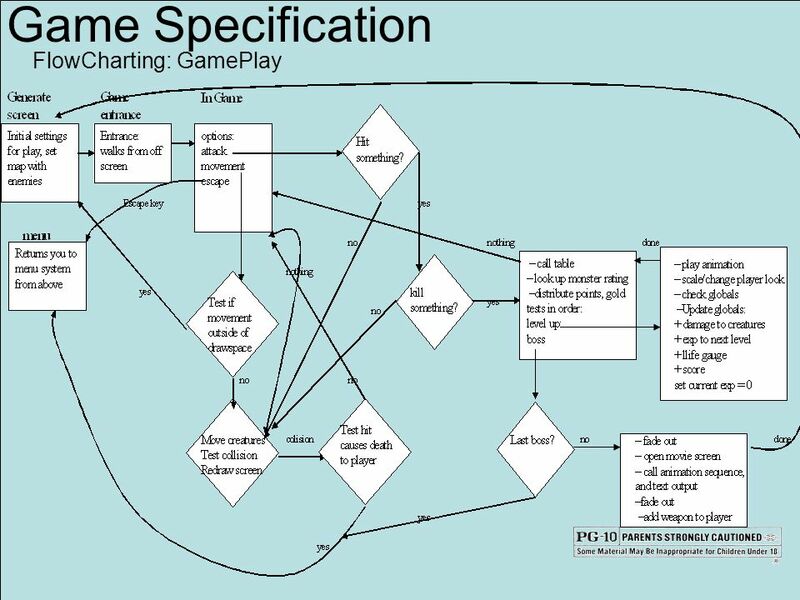 Development specification Today i am going to start out working on one of the game engines provided free on the web, making a rapid prototype. This is so i can hopefully make something that is complete and isn’t lacking in any of the features i have mentioned later on threw the document. 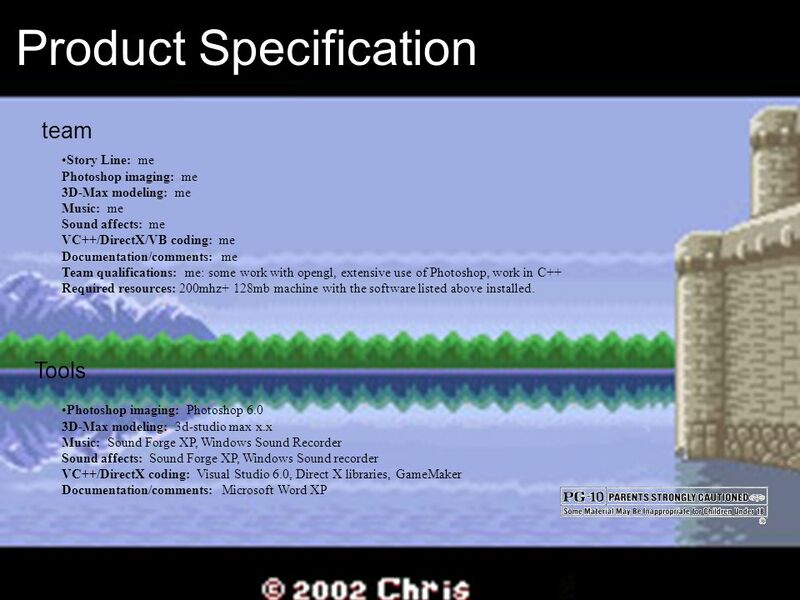 Future i would like to port the whole thing into viso-c++ either with Open-gl or DirectX and make the game actually 3D with the. The other possibility is to make use of some of the engines that already do this like Dungeon Siege, and create a mod style game of that, but this wouldn’t allow for the sale of the game. Target Audience The basic jest of the game is simple enough to read and easier to play, essentially killing everything and you win, makes the game easy enough for most ages and since there are not any fancy combinations you have to do, or important items to locate and acquire, just about any age would have been viable. 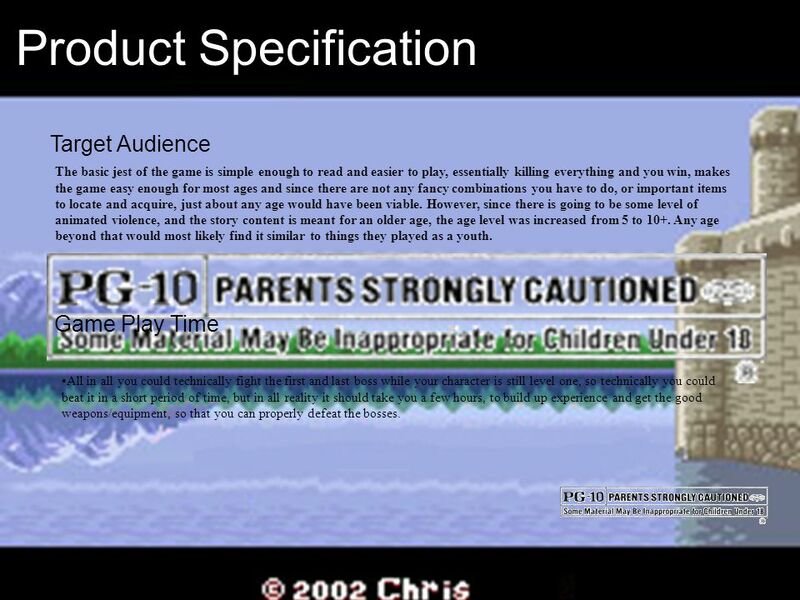 However, since there is going to be some level of animated violence, and the story content is meant for an older age, the age level was increased from 5 to 10+. Any age beyond that would most likely find it similar to things they played as a youth. Game Play Time All in all you could technically fight the first and last boss while your character is still level one, so technically you could beat it in a short period of time, but in all reality it should take you a few hours, to build up experience and get the good weapons/equipment, so that you can properly defeat the bosses. 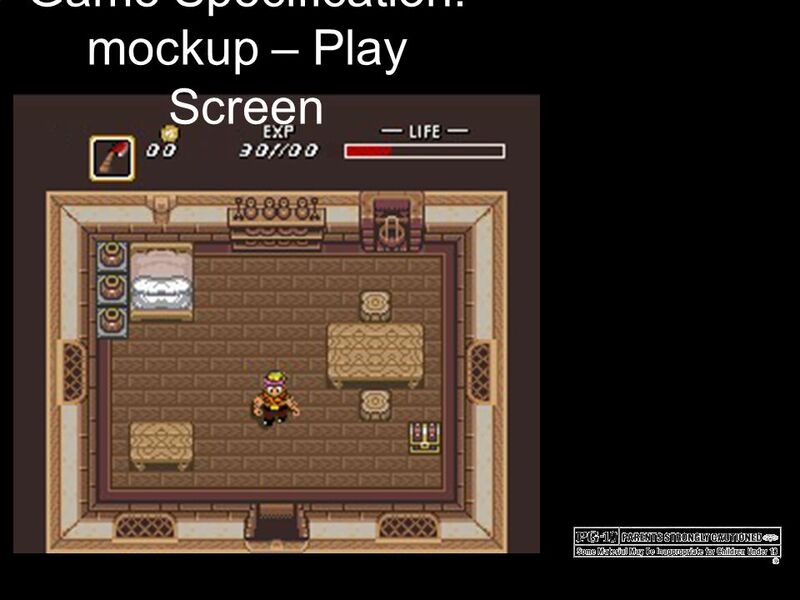 The play of the game is also similar to the game Zelda, possible changes as i actually code the game. 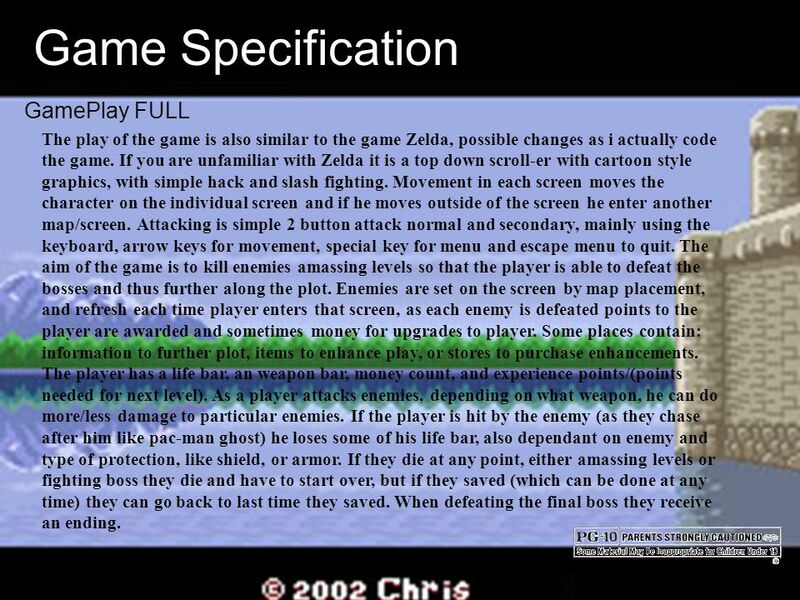 If you are unfamiliar with Zelda it is a top down scroll-er with cartoon style graphics, with simple hack and slash fighting. 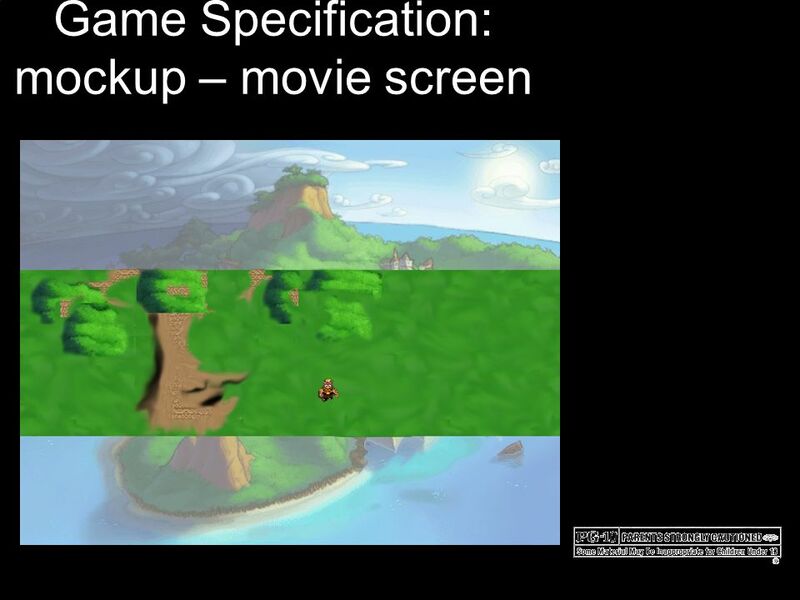 Movement in each screen moves the character on the individual screen and if he moves outside of the screen he enter another map/screen. Attacking is simple 2 button attack normal and secondary, mainly using the keyboard, arrow keys for movement, special key for menu and escape menu to quit. The aim of the game is to kill enemies amassing levels so that the player is able to defeat the bosses and thus further along the plot. Enemies are set on the screen by map placement, and refresh each time player enters that screen, as each enemy is defeated points to the player are awarded and sometimes money for upgrades to player. Some places contain: information to further plot, items to enhance play, or stores to purchase enhancements. 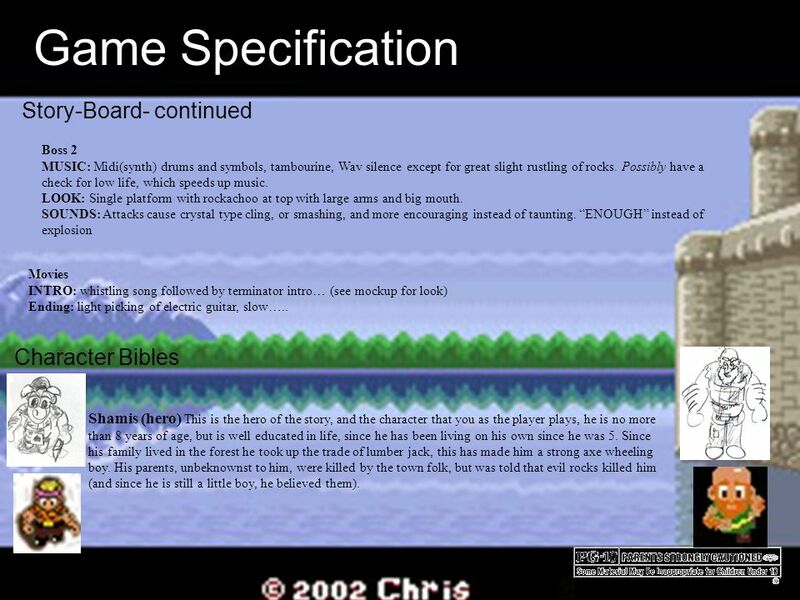 The player has a life bar, an weapon bar, money count, and experience points/(points needed for next level). As a player attacks enemies, depending on what weapon, he can do more/less damage to particular enemies. If the player is hit by the enemy (as they chase after him like pac-man ghost) he loses some of his life bar, also dependant on enemy and type of protection, like shield, or armor. If they die at any point, either amassing levels or fighting boss they die and have to start over, but if they saved (which can be done at any time) they can go back to last time they saved. When defeating the final boss they receive an ending. Simple is the life of our hero shamis roughneck, a lumberjack by trade, and a fun loving child of 10. Our story takes place in a little land called hoogle-shnoze, and shamis has been raised by himself mostly since his parents were stoned to death by an angry mob. Fortunately for shamus they didn’t feel that the child was deserving of their parents fate. Hiding this fact from shamis by telling him that his parents demise was caused by a lode of shale. The only other thing that has eluded his knowledge is the fact that his is not the only sentient species that cohabitates this place, the others are: the stone, the trees and ore, or for us simpletons, rock paper scissors. Being on his own he sets out to make some more money by going into the deep forest where trees have grown in the wild for centuries and haven’t been touched…and for good reason as he comes to find out. He finds a talking tree that reprimands him for trying to cut him down, and then proceeds to tell him he could give him something more precious than his hide if he goes and saves the tree princess from the evil tree bark who ate her for her powers. 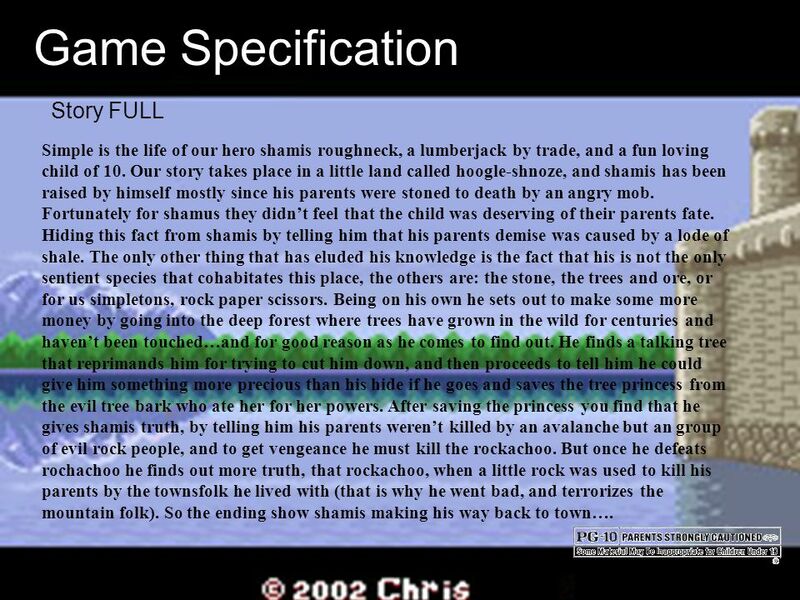 After saving the princess you find that he gives shamis truth, by telling him his parents weren’t killed by an avalanche but an group of evil rock people, and to get vengeance he must kill the rockachoo. But once he defeats rochachoo he finds out more truth, that rockachoo, when a little rock was used to kill his parents by the townsfolk he lived with (that is why he went bad, and terrorizes the mountain folk). So the ending show shamis making his way back to town…. Level One MUSIC: Midi(synth) airy, woodwinds, Wav lots of creeks, cricket sounds, birds chirping, leaves rustling and much recorder. Possibly have a check for low life, which speeds up music. LOOK: forest, lots of trees, autumn-ish, dirt/gravel paths with rest tall grass. As you progress further into forest it gets darker(hint for player to get to boss) Possibly: dark with flashlight, or just dark surroundings, Mario background movement, for leaves/branches above user. Enemies are menacing tree types, and some dark sprites. SOUNDS: wav’s of enemies are of trees falling when death, axe chop when player hits enemy, pop and squeak for sprites Boss 1 MUSIC: Midi(synth) Pipe organ, Wav silence except for great creaking wood, and a little rustling of leaves. Possibly have a check for low life, which speeds up music. LOOK: Single room tree stumps in a circle, large stump at top, high grass all around, princess in green gem in forehead of huge stump. SOUNDS: constant taunting, echoing voice possible hint of creaking wood while talking, explosion when dead. Level Two MUSIC: Midi(synth) picking acoustic guitar, and trumpet, Wav random little bits of rock crumbling. Possibly have a check for low life, which speeds up music. LOOK: mountain path, slate path. As you progress more jagged rocks in path, less movement in path(hint for player to get to boss) Possibly: possibly fall of into sharp rocks/death, Mario background movement, for smoke and vultures above user. Enemies are rocks that come to life when touched/ bumped. SOUNDS: wav’s of enemies are of different sizes of rocks smacking each other, avalanche sound when they perish. 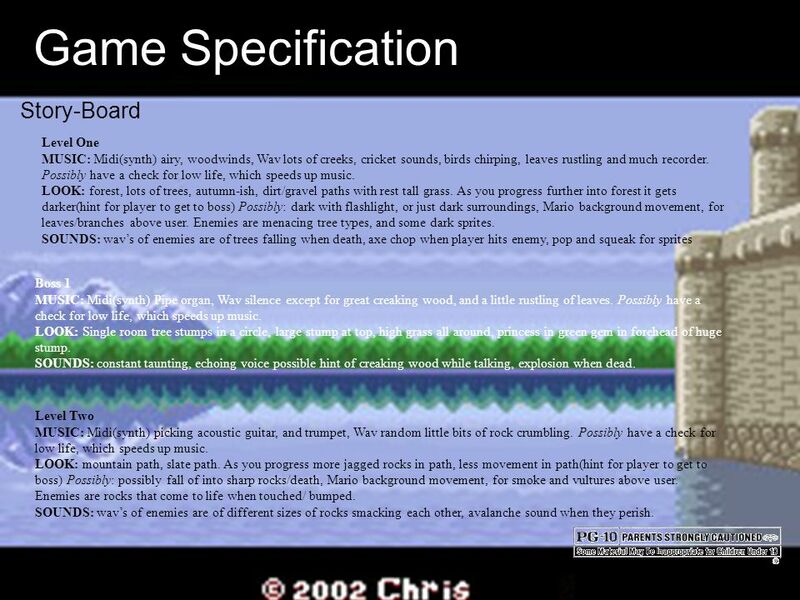 Game Specification Story-Board- continued Boss 2 MUSIC: Midi(synth) drums and symbols, tambourine, Wav silence except for great slight rustling of rocks. Possibly have a check for low life, which speeds up music. LOOK: Single platform with rockachoo at top with large arms and big mouth. SOUNDS: Attacks cause crystal type cling, or smashing, and more encouraging instead of taunting. “ENOUGH” instead of explosion Movies INTRO: whistling song followed by terminator intro… (see mockup for look) Ending: light picking of electric guitar, slow….. Character Bibles Shamis (hero) This is the hero of the story, and the character that you as the player plays, he is no more than 8 years of age, but is well educated in life, since he has been living on his own since he was 5. Since his family lived in the forest he took up the trade of lumber jack, this has made him a strong axe wheeling boy. His parents, unbeknownst to him, were killed by the town folk, but was told that evil rocks killed him (and since he is still a little boy, he believed them). Game Specification Character Bibles- continued Rockachoo (Last boss/rock boss) Large rock troll who supposedly was the leader of the gang that killed his parents, even though he isn’t he is still a evil and nasty rock beast. His main attack is throwing rocks. Since he does have contacts with many rocks he knows the truth about his parents death, but doesn’t think the kid is worthy of the information. Nymphomous (Tree leader) Despite living in a forest and being a lumber jack shamis has never met tree folk. However being a lumberjack all the woodland creatures find him to be evil and attack on site. But Nymphomous is the head tree elf of the forest is willing to tell you everything she needs to know, but she is presently trapped and must be rescued from her nemesis bark, a giant tree that ate her for her powers. Bark (Tree boss) This huge tree feels that you, being part of the populus, are the cause for all their fires and cutting down of trees. Which is mainly true, but this tree has decided to do the same to all human folk. 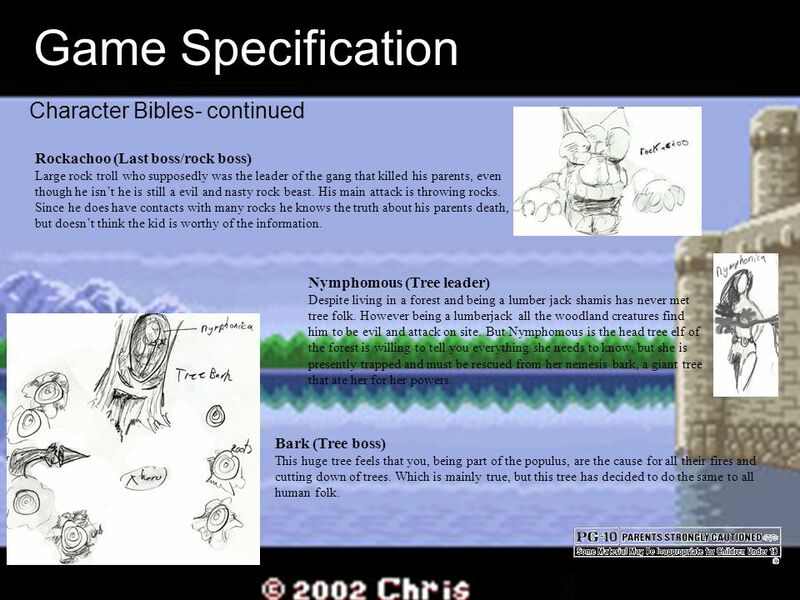 Game Specification Character Bibles- continued 2 Sprites, twigs, and saplings Minions of the tree monster called bark. These simple fairy creatures attack on site. Each being stronger than the previous, and larger. Pebbles, rocks, and boulders Minions of the Rock boss. These are simple granules which are stronger than the previous, and larger. Townsfolk Despite the odd look, as though they all live in caves, they are quite nice and treat you with moderate respect, despite the fact that not one of them would take you in when your parents died. They can be somewhat helpful selling you items, swindling you out of gold … etc. 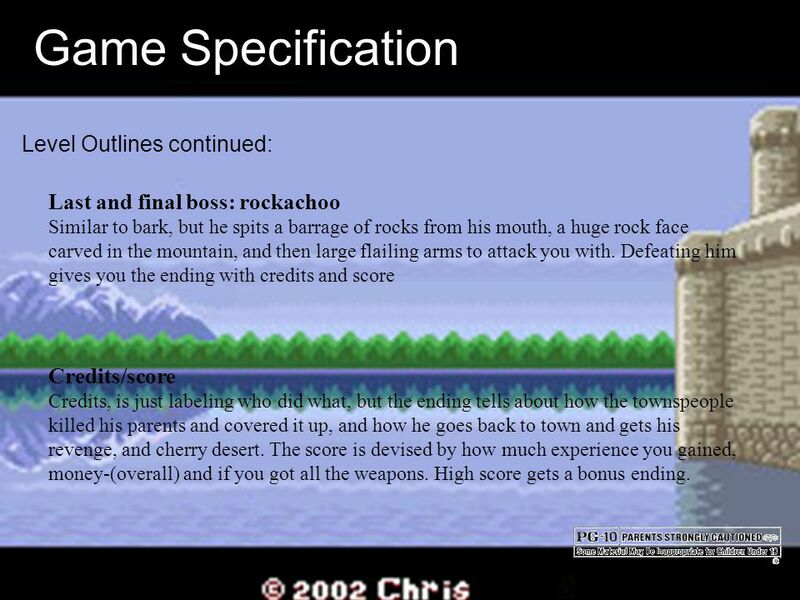 Game Specification Level Outlines continued: Last and final boss: rockachoo Similar to bark, but he spits a barrage of rocks from his mouth, a huge rock face carved in the mountain, and then large flailing arms to attack you with. Defeating him gives you the ending with credits and score Credits/score Credits, is just labeling who did what, but the ending tells about how the townspeople killed his parents and covered it up, and how he goes back to town and gets his revenge, and cherry desert. The score is devised by how much experience you gained, money-(overall) and if you got all the weapons. High score gets a bonus ending. 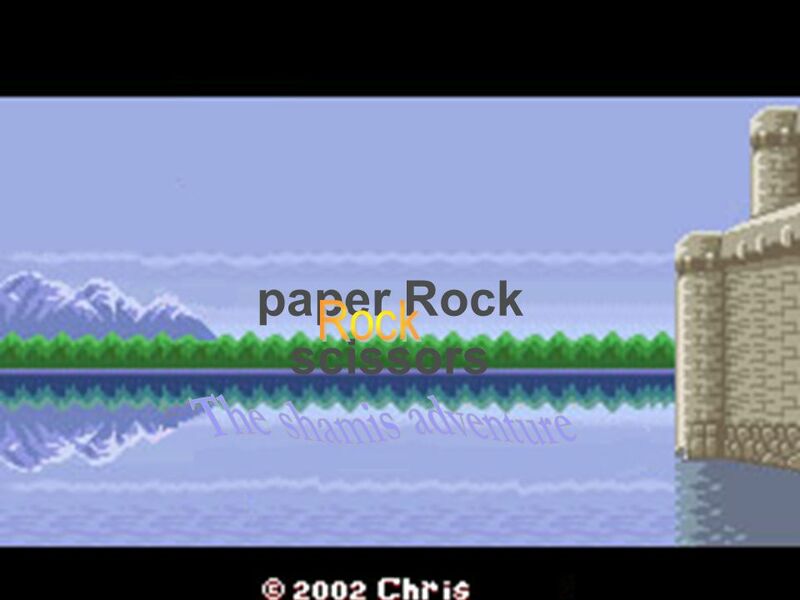 Download ppt "Paper Rock scissors Rock The shamis adventure." First of all – lets look at the windows you are going to use. At the top you have a toolbar, with all your various tools you can use when customising your. Can you guess what these idioms mean? INOCULATE THE EGGS BY: HEAVEN AND PAUL INTRODUCTION PART A, B, C, D, E, AND F OF OUR CONCEPT. OUR S.W.O.T. ANALYSIS. TARGET MARKET. PRICING. PRODUCT. 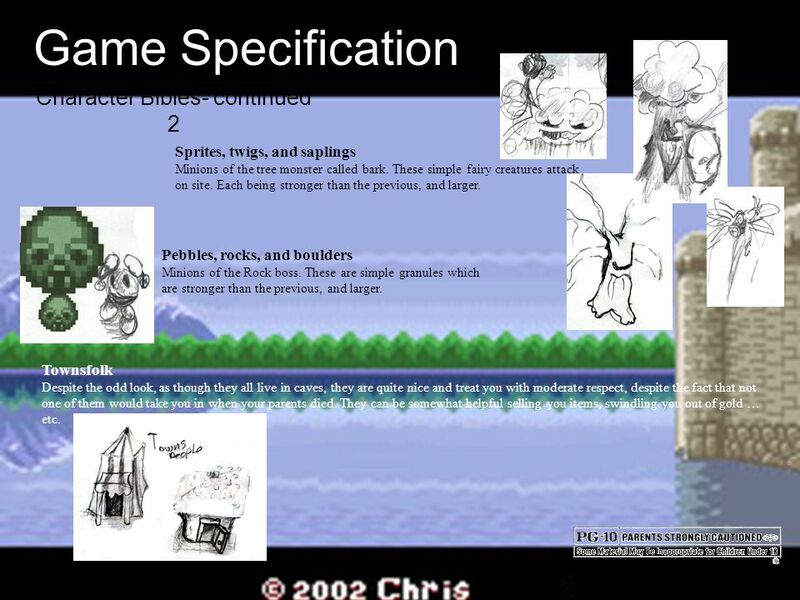 Video Game Design Lesson 1. 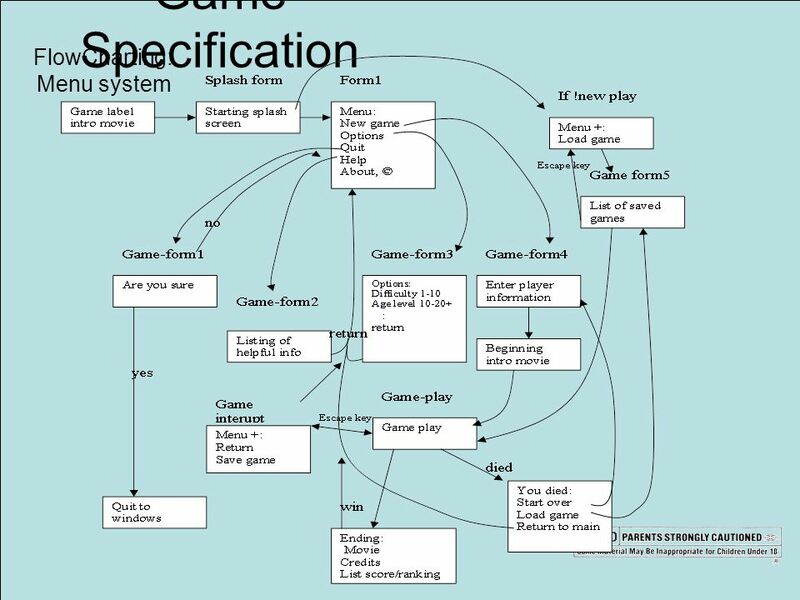 Game Designer Person involved in the development of a video game Person involved in the development of a video game Usually. The Last Dragon By: Aliya R.. What we had to do! Our class had to make Wikistastic book reviews. They were due this Thursday. Our reports had to include. Michael Mann COLLATERAL, This is the opening title sequence of collateral. Space Cadet Defender HD CIS 587 Game Evaluation – Ruth Johnson. 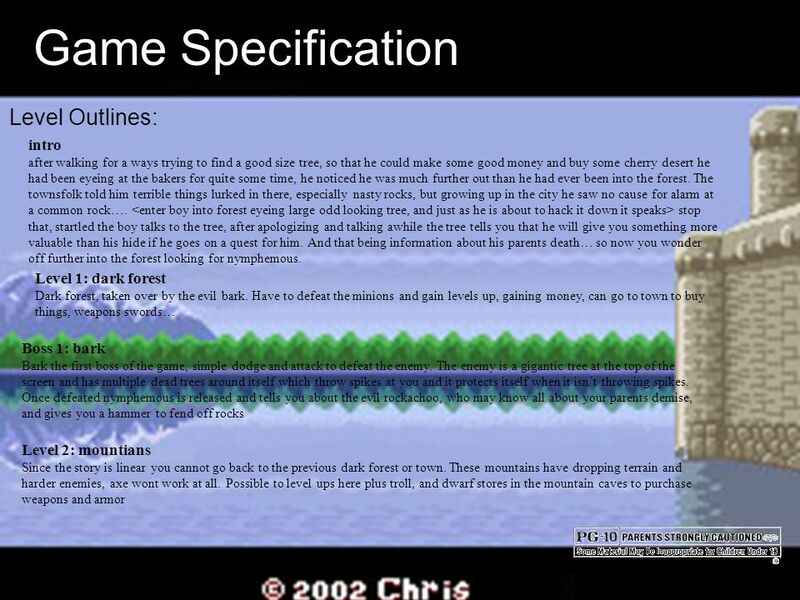 M.S.T.A Monkey’s Sustainable Tree’mendous Adventure AIM: To design a prototype adventure game for a local primary school that helps children learn about. Buddha’s Birth Buddha was a prince. He lived in India with his mother and father, the king and queen. The King and Queen were admired, loved and respected. By: Anthony Bryant. Grendel Grendel went into the hall while everyone was sleeping and snatched up 30 men and smashed them. Grendel was tired of hearing. Space Rescue Chad Seippel Cory VanHooser. Story 2050 brand new International Space Station Distress call from ISS about “alien attack” No further communication. Raising Boy’s Achievements in Writing Jenny Clarke Little Sutton Primary School. Maple Story By: Nick Martineau. General Game Information Title: Maple Story Company: Wizet\NX Games Type: Side Scrolling 2D MMORPG Price: Free. The Lord of the Rings The Return of the King. Basic Information Company: Electronic Arts (EA) Author: ▫lead designers: Bret Robbins & Chris Tremmel ▫Lead. P3 Sight Words. You will have four seconds to read each word. 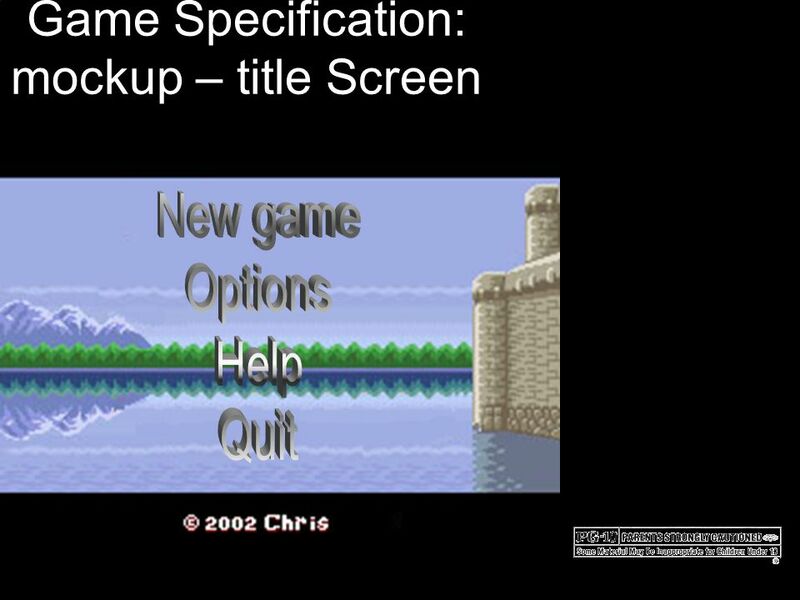 After that time, the slide will change to show the next word. Pay close attention so that.